That's a possibility for this year's OZZFEST MEETS KNOTFEST. 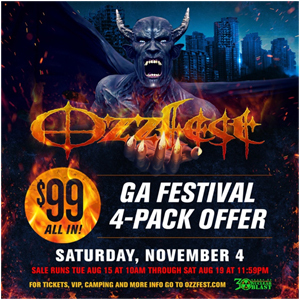 For just $99, you and three friends can attend either OZZFEST (Saturday, November 4) or KNOTFEST (Sunday, November 5) at Glen Helen Amphitheater and Festival Groundsin San Bernardino, CA. A limited number of the single day $99 four-pack GA ticket bundles will be available from Tuesday, August 15 at 10:00 AM (PT) through Saturday, August 19 at 12:59 PM (PT). The two-day festival's power packed line-up is led by performances from OZZY OSBOURNE and PROPHETS OF RAGE on Saturday at OZZFEST plus ROB ZOMBIE and MARILYN MANSON at KNOTFEST on Sunday. The multi-stage, three-day camping event will include sets from more than 40 acts. 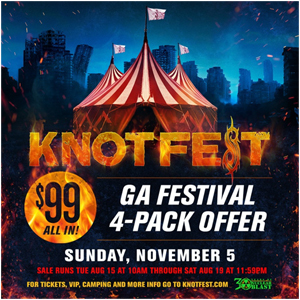 The weekend-long OZZFEST MEETS KNOTFEST will kick off with an exclusive free Friday, November 3 camping kick-off concert that will give campers early access to the campsite, allowing them time to prepare for a night of performances from MONSTER MAGNET, BRANT BJORK, SASQUATCH, and LO-PAN. VIP camping lines open at 4:00 PM, general camping load in begins at 5:00 PM. Doors to the Friday night camping kick-off party open at 7:00 PM with live music set to kick off at 8:00 PM.